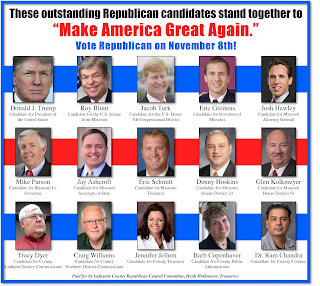 These outstanding Republican candidates stand together to "Make America Great Again." 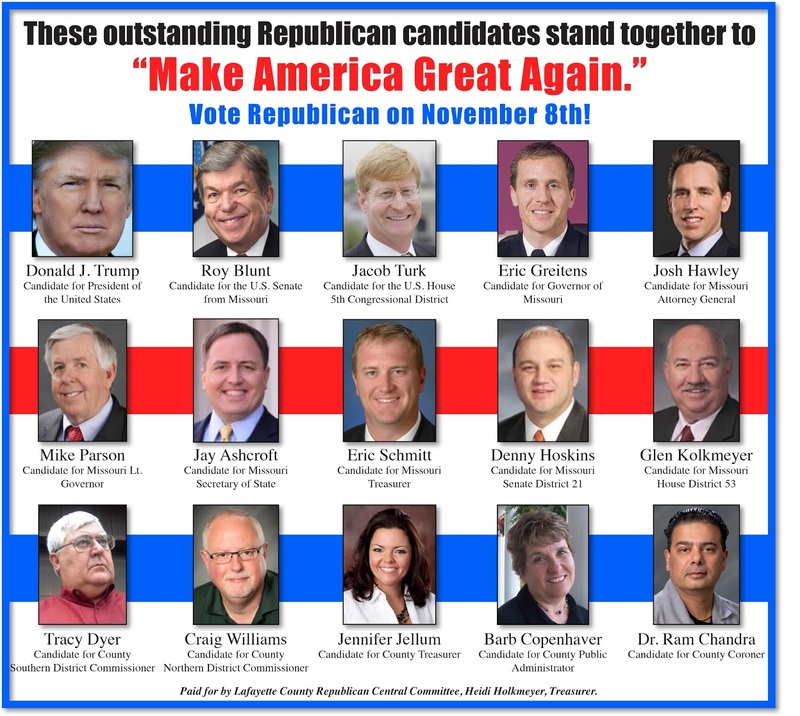 Vote Republican on November 8th! 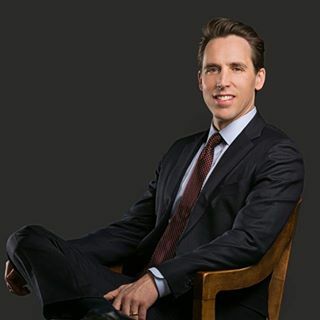 WEDNESDAY, NOVEMBER 2 -- Join us for a light lunch and visit with JOSH HAWLEY FOR ATTORNEY GENERAL AND JAY ASHCROFT FOR SECRETARY OF STATE. Time: 11:30 a.m. 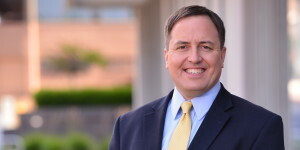 Location: ETS Office (Glen Kolkmeyer's office and our GOP HQ), 104 W. Old U.S. 40 Highway, Bates City. Subway sandwiches, chips and beverages provided by Central Committee. Don't miss this opportunity to meet and discuss the issues of the day with our next Attorney General and Secretary of State! 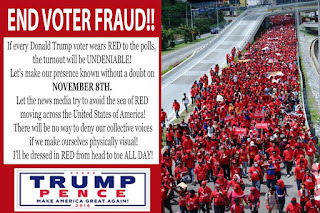 TUESDAY, NOV. 8th -- Don't forget to vote, and then join us for an ELECTION NIGHT WATCH PARTY! Details: Linda and Neal Niendick have offered to be our hosts at their home in rural Wellington. Come by their house after the polls close at 7 and bring one appetizer and beverages of your choice. It will be a great time to get together and watch the election results come in as they happen. 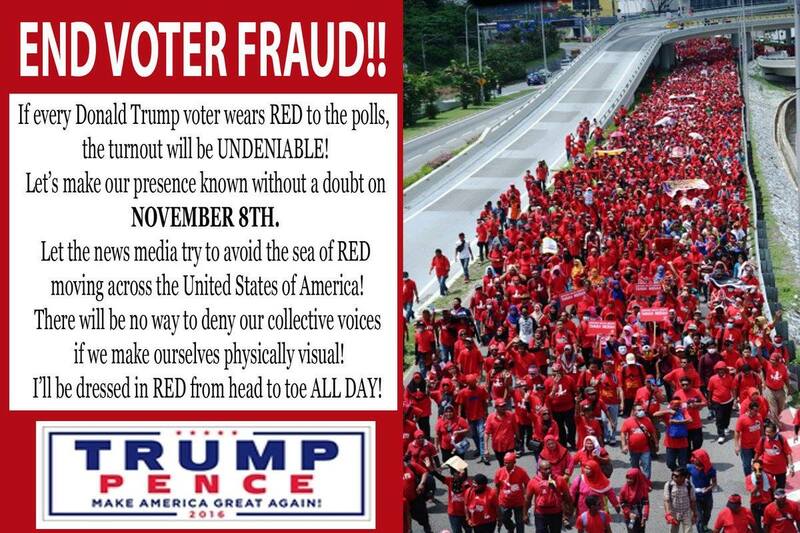 AND LASTLY BUT IMPORTANTLY, WEAR RED WHEN YOU GO TO THE POLLS TO VOTE ON NOVEMBER 8th!